Medewi is a beach village in West Bali. 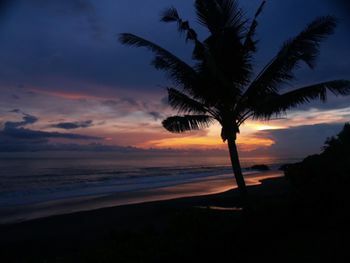 Medewi is located about 75 kilometres west of Denpasar on the main south coast road, about 34 kilometres further west than the town of Tabanan. Anyone who travelling from the south of Bali by road to the west coast port town of Gilimanuk will pass by here. This is a great place for walking. If you want to hire a motorbike your hotel should be able to oblige and expect to pay around Rp 70,000-100,000 per day. The beach is divided in to two main portions, the eastern half which is very rocky with some large flat grey stone boulders interspersed with pebbles and black sand, and the western half which is sandier. It's not the best beach for sunbathing or lounging, but good for long quiet strolls. 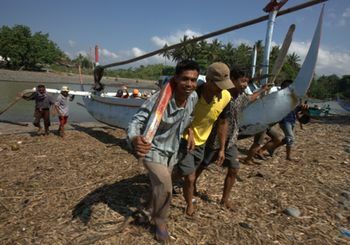 Local fishermen bring in their catch just east of the river mouth, which is accessible down a steep incline from the main road. You can buy really cheap and fresh seafood here of all types, or just go to check it out. Cows grazing, fishermans' wives mending nets, sales taking place, kids playing, and boats being hauled out of the water. The catch seems to come in until around 10AM or so. The sunset is over the Indian Ocean here which is quite magnificent. Bunut Bolong , AKA 'The Magic Tree'. About 20 minutes drive Northeast of Medewi, this amazing Banyan tree has somehow grown leaving a big enough gap in the centre for vehicles to pass straight through it. Up in the cooler hills it's a pleasant thing to do on a hot day. 1000 rupiah to park your bike, they'll then ask you to sign the guestbook and give a 'donation for the staff' for keeping the place free from litter - the donation is completely optional. Go Surfing where the long left hand wave at Medewi Beach rolls all year and is popular with surfers for that reason. The largest waves tend to be in July and August. There is also right-hand break less than 100 metres away around the northern point. When the surf is small there is also a beach break, working mid-tide, over the river mouth about 250 metres to the south south. There are several other surf breaks nearb, including Balian Beach (30 minute drive east). For updates on conditions is is worth checking Medewi Surf Information . Relax in the very quiet coastal village which nothing really is going on besides the bar, the surfing, and the local fisherman doing their business. Understand the origin of Medewi as a place name. This area was a forest with many Ketket or thorny trees. In Balinese, thorny forest is Alas Meduwi hence the place was named Meduwi which then became Medewi. Swim in a waterfall Juwuk Manis is 30 mins drive northeast of Medewi. Admittedly not Bali's most impressive waterfall, it's worth seeing if you won't visit the others, and makes a nice break from the heat as it's up in the hills. The steps down to the waterfall are very new and in good condition (2018), but there are a lot of them - 865 apparently - so take a bottle of water for the walk back up. You'll get some lovely views on the journey there and back. Entry 5000R, motorbike parking 2000R. All of the local bungalows and hotels have restaurants. Try Warung Bagus Heading west it is on the left on the main road between the turnoff to Kanpung Logi, Pulukan and the Medewi Point turnoff just past turnoff to CSB hotel. Look for Surfboard sign on left. Sayu the wonderful smiling lady owner cooks delicious fresh local meals, especially try the lumpia (Spring Rolls) they are excellent. Waroeng Ten Pandan About 1km west of Medewi Beach, close to a couple of the surf camps, this pleasant small warung serves the freshest seafood you could wish for with good sides and big smiles. Also a perfect spot to watch the sunset. Mains from 20,000. A beer on the beach for sunset is very much the order of the day. The town of Negara is about 15 km further west from here and then on to Gilimanuk, West Bali National Park, and ferries to Java beyond that. If you have your own transport, definitely consider the pretty spectacular road across the mountains to Seririt that starts only a couple of kilometers east of Medewi, then perhaps onward to Lovina. The road is marked by a drive-through banyan tree and sporadic but impressive views on the way up the southern side, and rice paddies and volcano views back down the north. This page was last edited on 30 April 2018, at 04:56.